How interesting if this is a masting season. 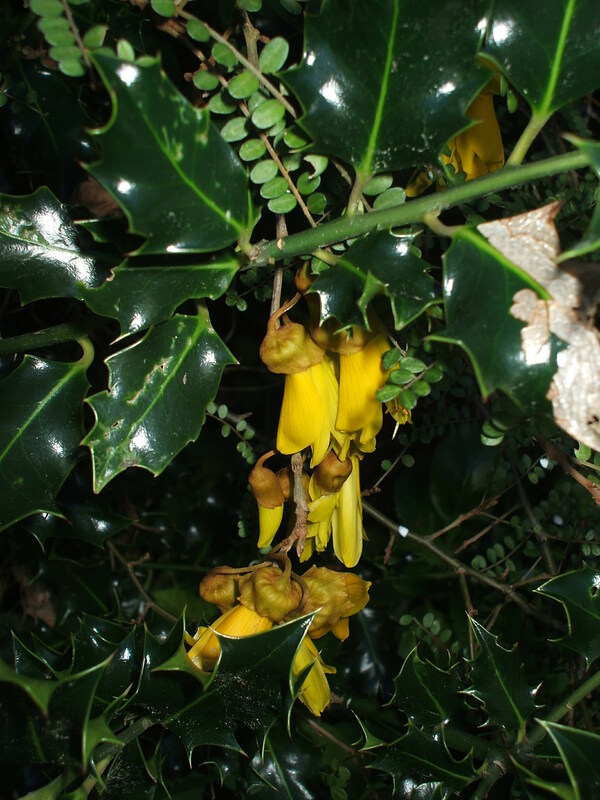 I haven’t seen many kowhai yet in Auckland, probably because it’s been raining so much. I’m intrigued by the presence of holly in your photo. I always note where holly is growing as at winter solstice I like to cut some for our rituals, but they are becoming harder and harder to locate in Auckland, especially ones that produce berries. 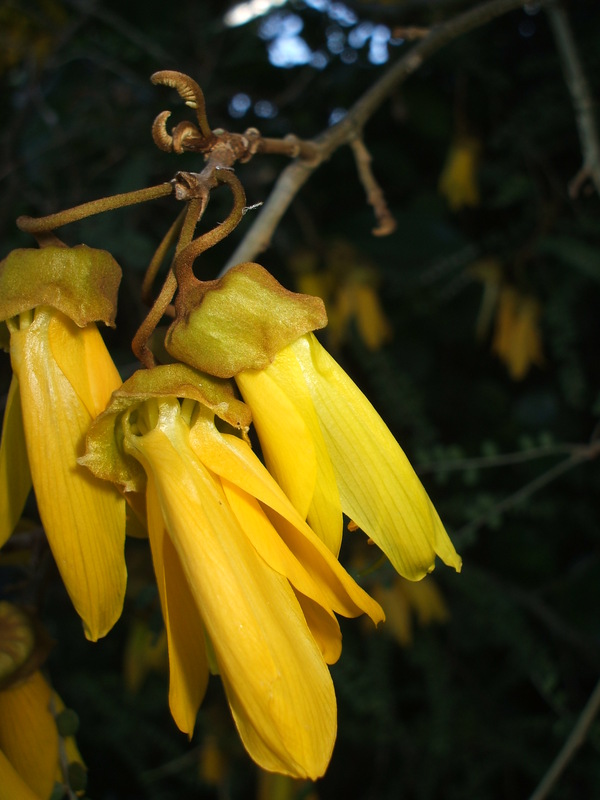 Love the close up photos of the kowhai. Have you got a special screw-on lens to take closeups? There was a short piece in the paper about the possibility of a masting season and it marries up with what I am seeing in my garden with the Griselinia’s. I will have many, many more of them if they seed prolifically. I could see Grey Warblers eating the flowers today in glorious weather. This holly is most interesting Juliet. The early European settlers to the area(circa 1856) planted the holly and there is a holly hedge that borders the burial ground. The holly produces red berries, although some bushes in the hedge produce paler coloured berries! The local council are growing more plants from cuttings from the hedge to fill in gaps. 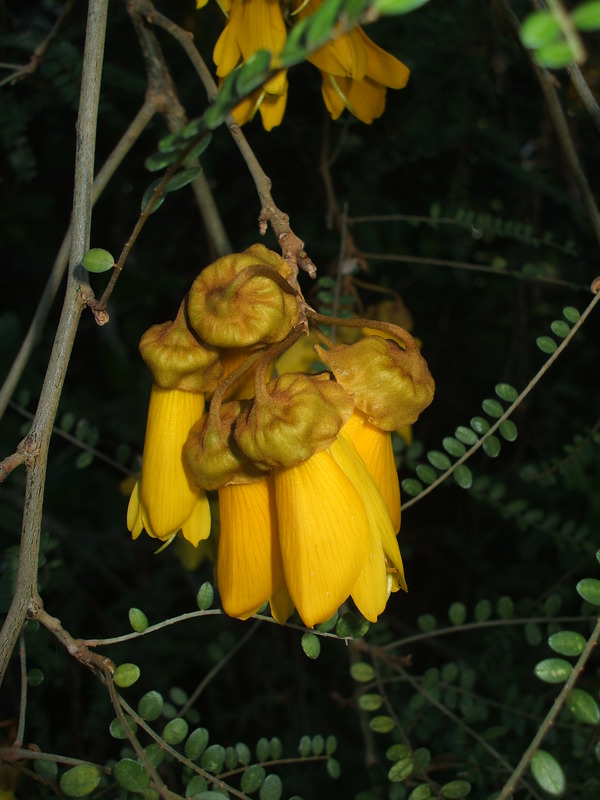 I was thrilled with my photos of the kowhai flowers. It would seem that a dark background helps my little point and shoot camera focus very sharply with the macro on. The macro feature is a real plus on this camera. I have no extra lens. I yearn for a stronger zoom feature to reach my beloved birds. That is not good to hear. We have such an abundance. I counted 8 Tui in a nearby Kowhai tree on Thursday. Curious…perhaps they will find it in time. Thank you I was totally thrilled with the kowhai pics- so many pics are deleted but these worked! I have often thought that we should see nectar dripping from Tui beaks. I love your image of dripping Kowhai honey…..yum! I will be doing a post on this sometime but we were on the banks of the Avon this afternoon and looking at a restoration project that has begun.One of its aims is to help bring the Tui back to Christchurch. Wouldn’t it be amazing if we had Tui in the middle of the city!!!! I hope the aim is fulfilled. I used to dream of Tui visiting my garden here when we first shifted here. Now the air is a-whirr with them and many other native birds. It is a real joy.